Online education in India has come a long way with the development of technology. India is one of the nations that is developing at an exponential rate in terms of technology. With the population of more than 1.3 billion, the availability of high-speed internet and smartphones, India has the most number of technologically driven persons. The rise of the internet has changed the way of life in India. People like to do everything online, they shop online, do business online, make friends online, learn online etc. While eCommerce being the most significant online industry, Online education and learning stand right next to it. With the ever-increasing information available on the internet and the countless number of online courses many people in India prefer to learn online. By Seeing the potential and immense popularity of e learning development and design digital technology in India, Our Honorable Prime Minister has envisioned transforming our nation and creating opportunities for all citizens by harnessing digital technologies Through digital India initiative. The initiative comprises of various projects in various areas relating to health, education,labour, employment etc. As a part of Digital India project, many colleges and universities offer online correspondence courses. Now let’s go through some of the interesting facts about online education in India. Online education market in India was worth $ 247 million in 2016, which is expected to grow about $ 1.96 billion by 2021. That is a compound annual growth rate of 52%. 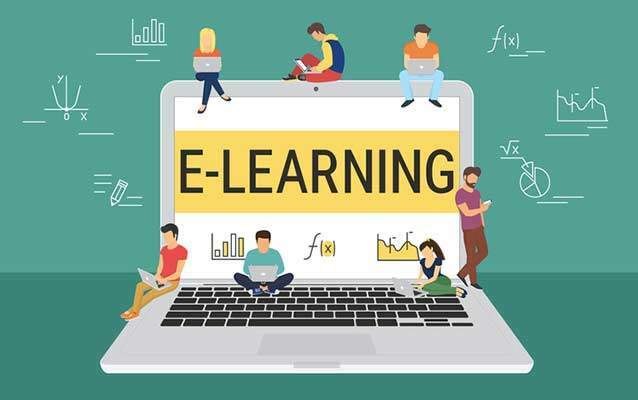 The number of users enrolled for various online learning courses is estimated to be 1.6 Million in 2016, Which is expected to grow about 9.6 Million by the end of 2021. It is estimated that there is a 175% increase in the cost of classroom education, this gives online education more preferred because it is cost effective. Nearly 48% population in India between 15–40 age group with high aspirations but lower income is a good target market for online education. And, the acceptability of online channel is high in the younger demographic. These factors clearly show the involvement and future potential of online education in India. Now let’s discuss some of the advantages and disadvantages of online education over traditional education. Since online education only requires a laptop or a smartphone with an internet connection, students can learn anywhere at any time. This flexibility helps working professionals to pursue new courses without giving up their jobs. They can learn at weekends or in their free time. All the course materials are readily available at student’s fingertip. Online education is much more cost effective than doing a regular on-campus degree. It helps students who cannot afford a regular college degree to accomplish their dream without spending a fortune on college education. Since you study at your own time, it helps to save time as well. Everyone learns at a different pace. In a classroom where everyone taught together, many students find it difficult to follow the lessons. This is a serious disadvantage of traditional education. Online education solves this issue. In online education all the course materials are provided beforehand, students learn it by taking their own time. Students can clarify their doubts by live chats or forums as well. Online degrees are accepted by many companies and employers in India as long as it is accredited and approved by Distance Education Council (DEC) of India. Many of them are encouraging their employees for getting online education as well. Students can easily lose track of their studies in online education since there are no face-to-face lectures and classmates to remind you about assignments. Until and unless you keep yourself motivated it takes a long time to complete your course or abandon your entire course. There are many websites that offer online courses without the accreditation of any educational authority or in the name of fake authorities. Such courses will not help you to get any job. So it is very important to choose an accredited online/distance program before you spend money on it. You cannot do an engineering course or any other course that requires labs or hands-on workshops online. Also in courses like MBA you miss the chances of professional networking, overseas experience etc. Which is considered an important part of the course. What Are the Popular Online Courses in India? Online MBA, Big Data &Business analytics, Digital marketing and Programming Remains the most popular courses learnt online by Indians. Here are some of the websites where you can learn above-mentioned courses online. Putting it altogether India has great potential and opportunities in the educational technology sector with rising young population, increasing internet penetration and acceptance of online learning as a cost effective-channel.